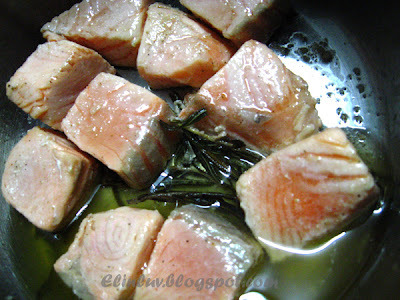 Simple preparation of this fish will bring out the natural flavor of salmon . I prefer it not overcooked, just cooked and still has the beautiful tinge of orangey red color . 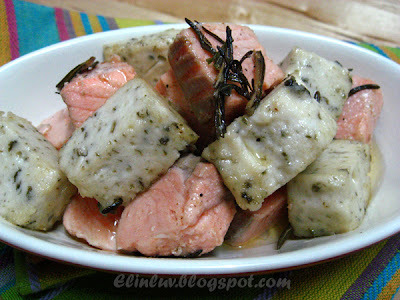 The secret of cooking this salmon cubes is to heat up enough oil ( olive or grapeseed ) in a deep medium size pot . 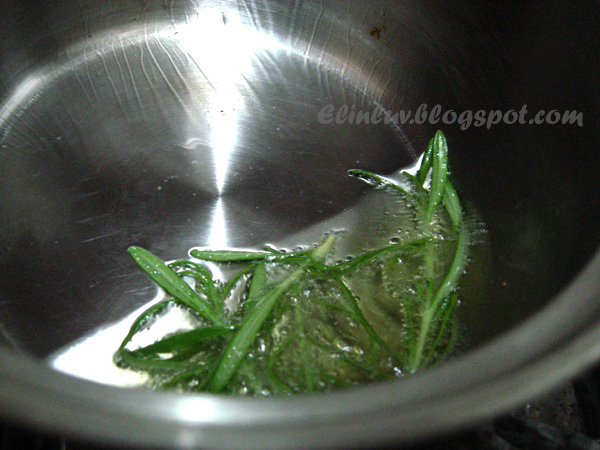 And when the oil hot ,add in 2 sprig of rosemary and let in sit in the oil for 1 minute. Off the heat, put in the salmon cubes and let the salmon sit in the rosemary infused oil for ten minutes, swirling the oil around the salmon cubes to make sure that it is evenly cooked. 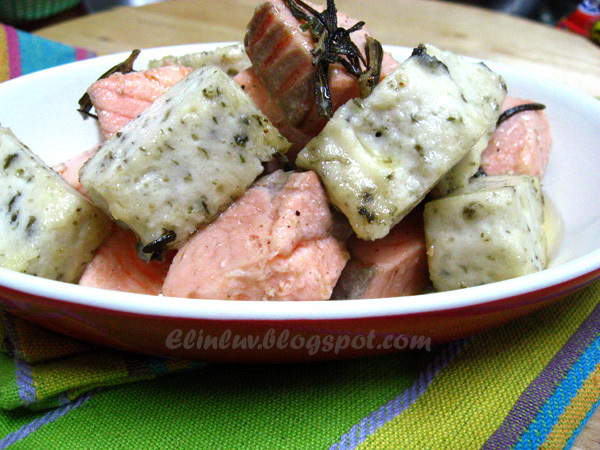 Take the cooked salmon cubes out and place them in a serving plate. Leave aside while with the remaining rosemary infused oil. 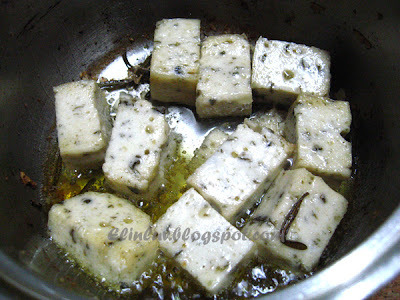 Add in the organic seaweed tofu into the oil, and on low heat, keep swirling the oil around the tofu till it is lightly brown. Dish up and serve together with the salmon cubes. Simple and delicious . 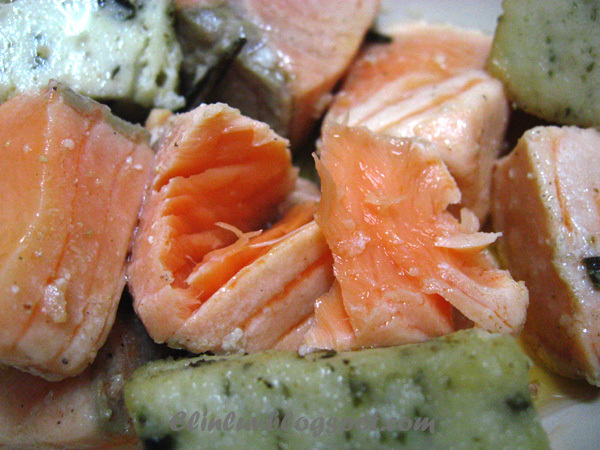 Easy to prepare salmon dish that every busy Momsie or Wife would be happy to cook for their families :p A hearty healthy meal for Daddy and myself ! You can join me and drool and salivates together with me , for I am hungry again just looking at them ....mouth-watering piece of goodness. 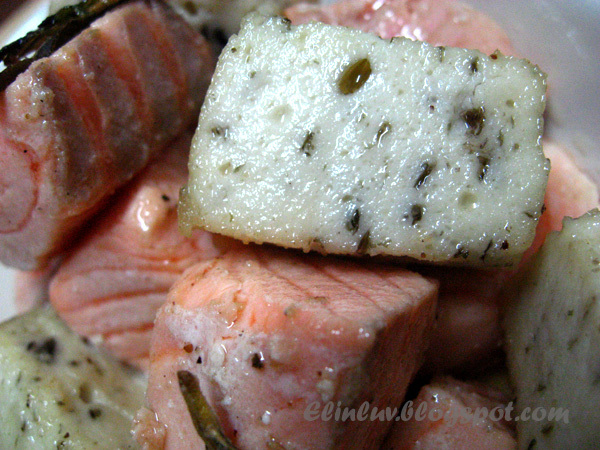 your salmon looks delicious, and well prepared...but what really intrigues me is those tofu cubes...I would love to try those....how unique! Elin, the seasweed tofu looks totally tasty! I think I might try to add some seaweed into tofu next time when I make them. Now I must get some soya beans. The salmon looks so good. I have to tell you when I saw the message photo on Foodbuzz I thought it was for sushi , hehe, I love it and I would eat it raw because you made it look so delicious. 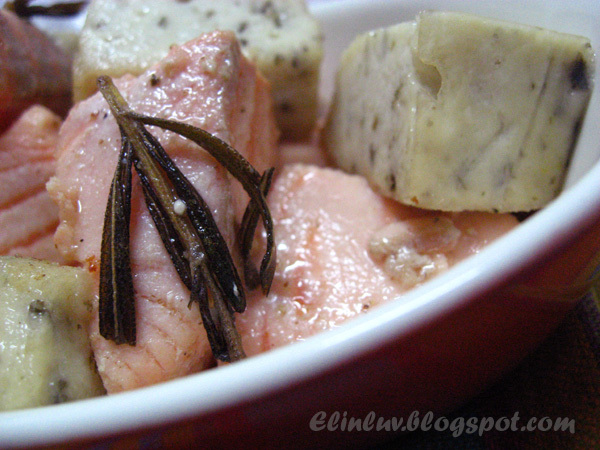 I like to eat salmon no matter how it's cooked and yes, it's quite a pricy fish! I could just have it once a week. I saw this seaweed tofu being sold at the supermarket here. 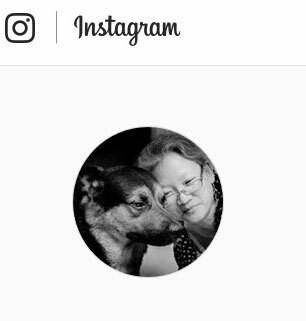 Will try it some day! 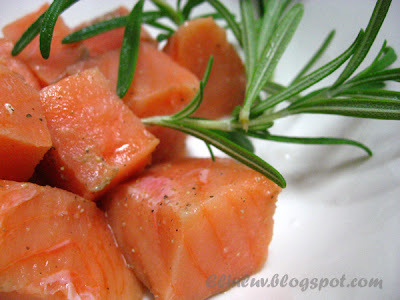 Theresa....the salmon are cooked in the hot rosemary infused oil and it tasted great. this dish looks delicious! i'll have to go find some of this seaweed tofu.